Virginia promised Amazon it will spend up to $295 million on transportation projects, plus money given directly to Amazon if the company brings all of the jobs it promised to the Crystal City area. WASHINGTON — As part of its promise to Amazon, Virginia will pay to construct a second entrance to the new Potomac Yard Metro station, a project that had been controversially and quietly cut earlier this year due to cost concerns. “We’re very excited. The $50 million for this entrance will really improve access off of Potomac Avenue from the south … for residents and businesses in the area,” Alexandria Transportation Director Yon Lambert said. Construction on the Potomac Yard station, between Braddock Road and Reagan National Airport on the Blue and Yellow lines, is just getting underway. The station, now expected to cost around $370 million in total, is due to open around 2022. The additional entrance would be added around 2026. Cutting the entrance became an issue in June’s mayoral and city council races in Alexandria. In all, Virginia has promised Amazon it will spend up to $295 million on transportation projects. That’s on top of the money being given directly to Amazon if the company brings in all of the jobs it has promised to the Crystal City area. Beyond the Potomac Yard entrance, money is also slated to help fund a planned second entrance on the east side of the Crystal City Metro station, for projects to make it easier and safer to cross Route 1, for an already planned pedestrian bridge between Crystal City and Reagan National, and for the ongoing expansion of transit service connecting Pentagon City, Crystal City and Potomac Yard. The pedestrian bridge between Crystal City and Reagan National would be funded once Amazon has at least 2,500 employees, which could mean it will be built as planned within the next few years. Lambert hopes new workers whose jobs are moving to the area will mostly use transit, bike or walk, which would reduce the amount of additional traffic issues along Route 1 and Interstate 395. “When you talk about how people are going to be getting to the HQ2 campus, we think transit first,” Lambert said. A complete shutdown on the Blue and Yellow lines south of Reagan National is planned for months next summer, just as the first few hundred additional Amazon employees could come on board. In addition to Metrorail service, a newly expanded Virginia Railway Express station is also planned in Crystal City. And the District Department of Transportation is about to announce a selected design for an expanded Long Bridge over the Potomac that could allow for expanded commuter rail service. Metroway bus service in its own dedicated lanes to zip by traffic also links the entire corridor from a newly planned Virginia Tech campus in Alexandria to just south of Pentagon City in Arlington, and is slated to have additional transit way space to the Pentagon City Metro soon. Up to $20 million in planning funds would be allocated up front by Virginia to the Route 1 improvements, pedestrian bridge to the airport and transit expansion. “We need to be able to move people from point A to point B, and I think this is a real shot in the arm for our transportation system here in Northern Virginia,” Virginia Gov. Ralph Northam said Tuesday afternoon. He praised the dedicated funding put in place for Metro earlier this year as reassuring to Amazon in the final decision-making process. The additional state money is not expected to replace regional funding already allocated to a number of these projects. “We’re not seeking to ‘get money back’; we just want to ensure that the investments are made and that they come to fruition,” Monica Backmon, Northern Virginia Transportation Authority executive director, said Tuesday. The authority distributes additional sales tax money collected in Northern Virginia to projects meant to reduce congestion. 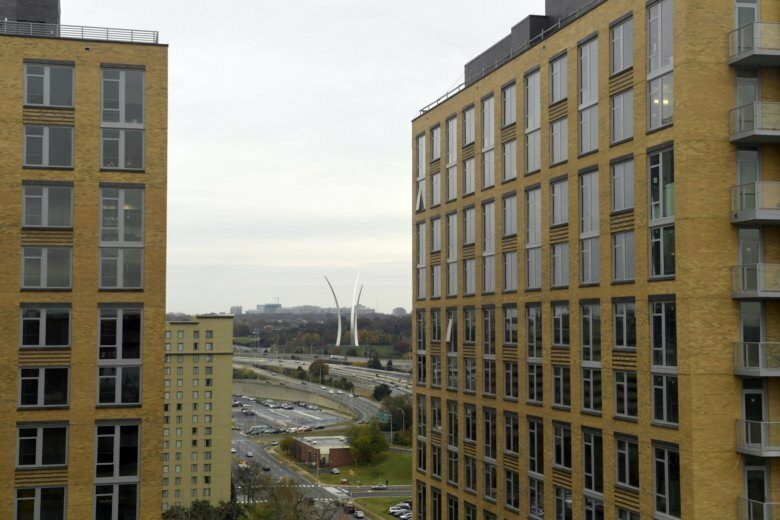 “We have put some funding on both of the projects, the second entrance for Crystal City … and we also have funds on the Crystal City platform extension for VRE, so we’re trying to work with the locality, Arlington County,” she said. Though traffic and transit issues are related to the slow-build of additional Amazon jobs over the next decade or two, it does not mean projects will stop elsewhere. “We don’t focus on any one particular area in Northern Virginia because the needs are everywhere,” Backmon said. With crowding and delays already common for many commuters, Lambert said there is still room to grow with more transit service and the other changes meant to make it easier to get around. “We can definitely handle it. We’re glad they’re here,” Lambert said. WTOP’s Megan Cloherty contributed to this report from Arlington, and WTOP’s Kristi King contributed to this report from Alexandria. Editor’s note: This story has been with a clarification from the city of Alexandria on Metro improvements.